QTS Realty, the first data center REITs to report second-quarter results this earnings season, has struggled in the year’s first half to post large year-over-year gains investors have come to expect from the sector. But the future appears to be brighter as the company sees strong demand across most of its markets, including: Dallas-Fort Worth, Chicago, and Piscataway, New Jersey. Leasing picked up considerably in the second quarter versus the first one, for which the company reported weaker results than was expected. 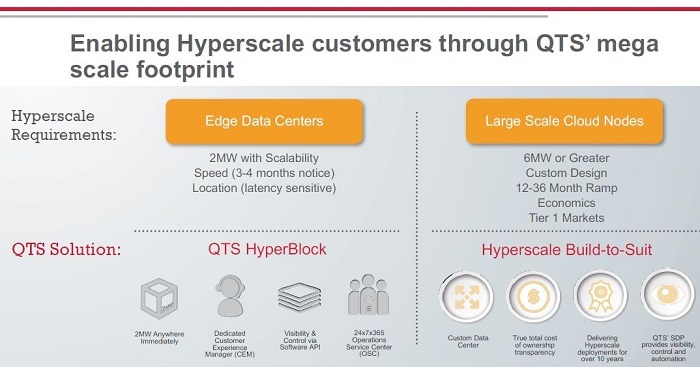 On its second-quarter earnings call, QTS management focused on new initiatives that should bear fruit in the year’s second half and beyond, including connectivity partnerships with PacketFabric and Megaport, as well as QTS’s new Service Delivery Platform and the HyperBlock modular wholesale product, its new data center design aimed at hyper-scale customers. 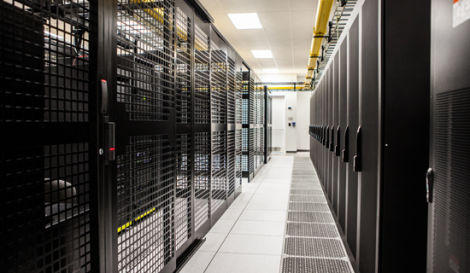 The data center REIT has had success with a land-and-expand strategy with some of the largest cloud, digital media, and software firms. HyperBlock, a reduced time-to-market product, was developed based on its experiences of the past two years. Read more: DCK Investor Edge: QTS’s Hybrid IT Strategy — Short-Term Pain, Long-Term Gain? There’s more to the HyperBlock announcement than the ability to build 2MW data center modules quickly. It is intended to target hyper-scale customer deployments proactively as a separate market segment, with tailored product offerings. HyperBlock represents a change in data center design philosophy for QTS, the company’s CTO, Brian Johnston, explained to Data Center Knowledge. Being a fast follower means QTS is willing to change its product road map to include options that will make its mega-data centers more attractive to this specific class of users. While QTS has leased large data halls — in the 10MW-to-20MW range — in the past, often to anchor a new campus, these deployments pre-date the latest initiatives by the largest public cloud providers. Its older C1 wholesale solution was originally geared to allow enterprise customers in the 500kW-to-6MW range freedom to co-create a custom data center design. These traditional wholesale customers often require a great deal of infrastructure redundancy. Enterprise customers can often take many months to decide on room layout, power distribution, and other customized elements. The RFP process has evolved during the past two years, as hyper-scale customers have worked with multiple third-party data center operators to standardize many of their requirements. Each of the public cloud giants has developed a program for what they need in a third-party data center build. This includes an accelerated schedule, from inking the deal all the way to timing and coordination required to roll in equipment. Hyper-scale customers don’t need as many electrical system components in their data center designs as traditional enterprise tenants do. Therefore, modular HyperBlock power distribution and UPS configurations provide for N+1 and N solutions at 200 watts per square foot, along with flexibility for hot aisle/cold aisle containment if higher densities are required. This design approach lowers cost-to-build, while increasing customer power utilization in each 2MW block. These changes provide QTS with higher returns per square foot on lower-rent leases and help minimize stranded power capacity. QTS can now offer 60-to-120-day data-hall build-out as part of its contract SLA. The company will continue deploying these 2MW modules on its traditional raised-floor data center space until it runs out. But the next version of HyperBlock will offer an option for customers to deploy their cabinets on concrete slabs, a more current design many of them use in their own data centers. This design option is expected to reduce cost and improve speed-to-market further, while also allowing for higher-density deployments. HyperBlock is an engineered turn-key solution, meaning the design includes everything from electrical and mechanical system configuration to connectivity and logistics. It also includes software APIs clients can use to manage infrastructure, life-cycle management, and support. Since hyper-scale customers tend to operate at higher temperature, each 2MW module comes standard with 30 temperature sensors which can be monitored on-site and remotely. 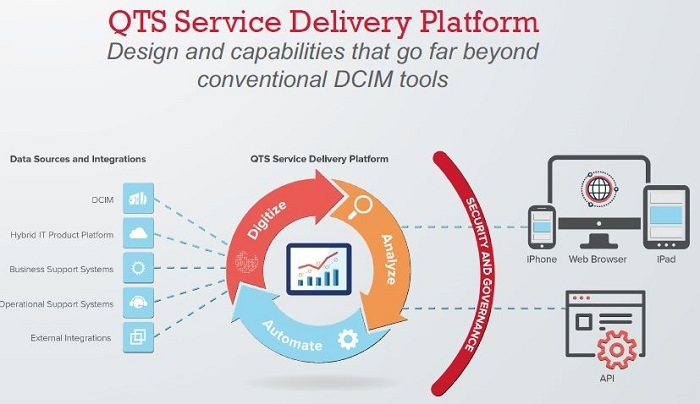 The data collected through the QTS Service Delivery Platform has an API that allows customers to export data into their own data management systems to help optimize performance utilizing their own proprietary algorithms.